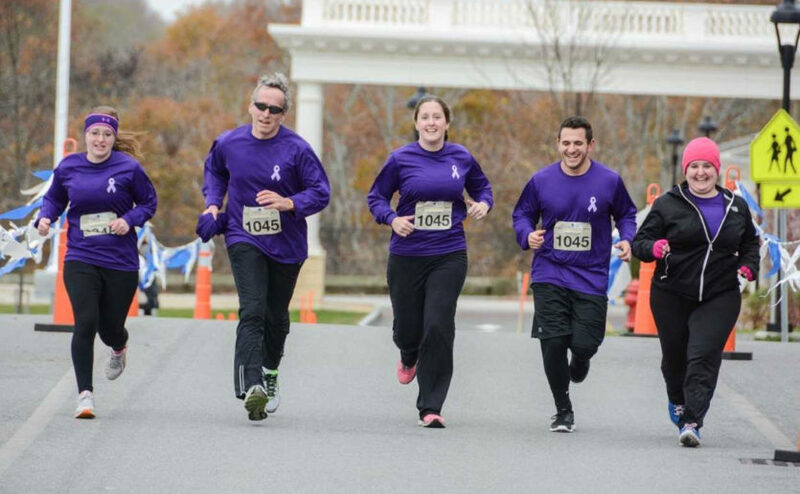 Members of the Cappetta family completing a marathon relay are, from left, Alyssa Cappetta, Charles Cappetta, MD, Kelsey Cappetta, Andrew Cappetta and Kate Cappetta. Andrew is running the 2019 Boston Marathon® in honor of his late mother. Andrew Cappetta will run the 2019 Boston Marathon® for his late mother, Joan, whose strength and selflessness during cancer treatment have inspired him to train for five months and raise money to help children with cancer. Joan Cappetta was diagnosed with pancreatic cancer in 2012. At the time, her four children were on the cusp of adulthood, and some had left the family’s Hollis, New Hampshire, home to pursue college and careers. Andrew, her youngest, was a senior in high school. For two years, Joan received care at the Massachusetts General Hospital Cancer Center. She underwent surgery, chemotherapy, radiation therapy and several other procedures. She did not want her children to move back home or place their dreams on hold. She told them that she knew they were always with her in spirit. Pancreatic cancer is aggressive — about 20 percent of patients survive one year after diagnosis. Andrew credits his mother’s longer survival to the care she received at Mass General. Joan passed away on Oct. 15, 2014, surrounded by her family, following complications after a courageous two-year battle. Andrew tears up as he remembers saying goodbye to his mother. He was 20 years old and a student at the University of New Hampshire, his mother’s alma mater. Now, Andrew lives and works in Boston. He thinks that while his mother would be proud of him for running the marathon, she would also be nervous about her “Andrew-man” taking on such a grueling race. Andrew’s father, Charles Cappetta, MD, is a pediatrician in Nashua, New Hampshire. His aunt, Ann L. Prestipino, MPH, senior vice president, Surgery, Anesthesia, Emergency Medicine and Clinical Business Development, has worked at Mass General for her entire 38-year career. All three of his sisters, Kate, Kelsey and Alyssa, are pursuing careers in health care and they all worked at Mass General at some point in their careers. Andrew also had an internship at the hospital. “Every day I marvel at my family members’ selflessness and the impact they are having upon the lives of others,” he writes on his marathon fundraising page. While training, Andrew reflects on his mother’s strength. “Even on the worst day of training, when your legs hurt and you are tired, it’s nothing compared to what these children with cancer are going through,” Andrew says. So far, Andrew has raised more than $11,000 for Mass General Hospital’s Pediatric Cancer Team through generous donations from friends and family members. He is confident he will reach his personal fundraising goal of $15,000. As he prepares for the marathon, Andrew thinks of his mother and reflects on her strength in facing pancreatic cancer. He hopes by giving back, he can help to make a difference in the lives of children battling cancer. To make a donation to the Mass General Hospital’s Pediatric Cancer Team, please contact us.